Overall, I do not like to review shows like this early, but like Attack on Titan, you cannot help yourself to control the awesomeness. The show follows the manga well so far( I highly recommend the manga to you guys.) So basically Mokochi(Tomoko) is a social recluse who sees that the 2D otome world doesn't work well in the 3D world. Her goal is to gain more friends and a boyfriend. Will her goal succeed? The show is a Dark Comedy, but it will defiantly hit home with the Hikikomori or social loners in the 3D universe... Luckily, the show is a normal length show, and the OP and ED...0_0 is all I can type; amazingly done for this anime. You can tell the production and animation put time into this show as the animation and Voice acting is good. First, I will give props to not Just a GREAT OP, but also, a great ED theme. My main focus for this anime will be the main protagonist, Kuroki. She is Amazing in every way. Super shy, but very blunt. Mentally disturbed and an what appears to be an insomniac. They take things that shouldn't be attractive and make it adorable. After watching just the first episode, I can already say, it's going to be one of my favorites this season. She sees her life as a Visual dating sim and even mentions to her brother, (who appears to have distanced in relationship with her through the years) that going to high school is HARD mode and college is NIGHTMARE mode game play. The plot of this story could go anywhere, but my guess, since I didn't read the manga, is that she will encounter somebody that breaks her from her shell of the antisocial lifestyle. If you like her views and personality, I highly recommend watching SNAFU from the Spring 2013 season, which also has an antisocial outcast protagonist. Looking forward to more laughs with this series! Our favorite "Spaghetti-tan" is now in her own anime. Who would had thought she would become so popular? The episode starts out nicely with her playing some eroge games and explaining the situation. It only gets better from there when she is placed in some awkward circumstances. she struggles with social anxiety which many of us otaku let's be honest, face day to day. So she really speaks to her crowd. This anime can be compared to others like Sayonara Zetsubou Sensei. You're either going to love WataMote or absolutely hate it, there is no middle of the road on those. Either Tomoko's social ineptitude is going to make you incredibly uncomfortable or feel deep sympathy for her and her attempts to partake in some semblance of social interaction outside of her family. 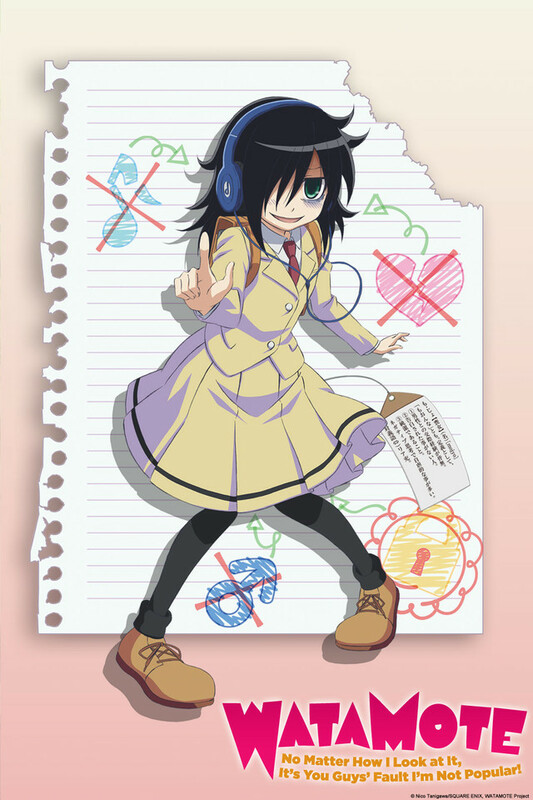 With plenty of moments of Tomoko's inner monologue's occasionally bordering on the 'extremely familiar' as some fans (and myself) have openly admitted, there's a great bit of familiarity to draw between the viewers and the central character, making for what I feel is an absolutely refreshing and cringe worthy but endearing show looking to be one of the best comedies this season. This anime made me laugh so much because on how I can relate to it. Hilarious. Made me grin the whole 1st episode. If the anime is as funny as the 1st episode till the very end of the series I think it'd be my new favourite anime. I have to say that after reading the Manga I was curious how the Anime Adaptation would turn out, and so far it hasn't disappointed. It takes one of the most mundane problems (Not Being Popular in High School) and turns it into some extreme, hilarious internal drama. Simple actions such as improving appearance and personality are taken to an extreme, and inserted into every day situations. Everyone else acts normal, while the main character looks and acts like a lunatic, and proceeds to blame everyone else for her issues...Just like a high school student would. The twist is, of course, that she externalizes nothing. You would expect Tomoko to eventually begin to come out of her shell, but instead she internalizes the smallest victories and learns little from them. Choosing to celebrate instead of grow, it makes it all the more hilarious when she wins, only to lose moments later. Everyone has gone through this phase, it just depends on how long it lasted. For some, it was minutes. For others, like Tomoko..Well, it's gonna be awhile. Give this Anime a shot, you won't be disappointed watching someone living (or reliving) these high school days as the recluse in the back of the room trying her hardest to subvert that very state of being. Hilairous - Really Tugs At My Heart! Wow, this might just be my favorite series of the summer anime so far and there's only been one episode. The main character, sadly enough, reminds me a little too much of myself. Awkward, gloomy, never attracting people's friendships easily. That last part isn't too good for your self-esteem believe me. Trivial stuff aside, I found myself a lot more invested in this story than I thought I'd be. The main character goes through her everyday life seeking ways to make herself popular and really does put effort into it, but her socially awkward demeanor prevents her from achieving even the slightest conversation with anyone outside her house. Can't even order from a fast food restaurant properly. There are many moments I've laughed at and many that tugged at my heart just because I understand her a little. She really is a pleasure to watch, and the Opening and Ending themes are brilliant. If you guys like comedies with a quirky protagonist and endearing moments sprinkled throughout, such as Oreimo, Hayate the Combat Butler etc believe me you'll love this.